Retail stores including boutiques, gift shops, and department stores are often looking for ways to improve their appearance and draw in new business. With the present economic turmoil, business owners need to be on their toes, using innovative techniques that will make their location attractive. A retailer’s product is key and yet the atmosphere is essential as well. A pleasing and eye-catching environment will ensure customers return and spread favorable compliments about their experience. 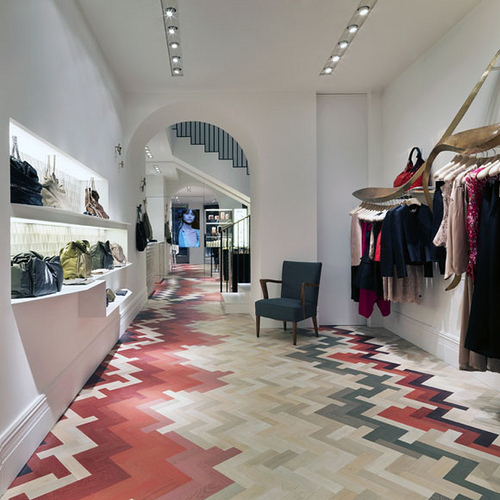 Restoration of flooring is one effective method for altering the appearance of any type of retail shop. While carpeting is a common choice for floor covering, it is difficult to maintain. With heavy traffic on a daily basis, constant cleaning is required and it is likely to need replacement in a short time. Hardwood flooring is an excellent alternative. Hardwood flooring does cost more initially. However, it is durable and with proper care, will give owners satisfaction for years to come. It is easy to keep clean with dust mopping and polish, adding an appealing flair to any setting. Should hardwood become scuffed or scratched, buffing and staining is an easy solution, rather than having to replace the entire floor covering. Another asset provided by hardwood flooring is versatility. There are so many styles in hardwood that are certain to entice a business owner. By selecting a variety of colors or types of hardwood flooring, a business owner can determine the direction in which a store’s decor will go. For individuals who wish to create an upscale environment, they can choose intricate patterns such as parquet flooring that is arranged in geometric shapes or in the form of a medallion. Beveled flooring that lines up perfectly can be chosen as well with a stain that is uniform to the rest of the business, creating a seamless blend in color and design. Others prefer a rugged or rustic look for their business. Wide plank flooring, wire brushed flooring, hand sanded flooring, and old growth planks are all alternatives which can create an old-fashioned appearance. Wood can have a distinctive texture and a faded appearance or be selected in a variety of colors that enhance the old-school motif in a business. Carefully chosen furnishing and accents complete the design. It is truly up to the extent of an interior designer’s imagination and a proprietor’s vision.Hardwood flooring is a creative way to make a statement in any retail location.